Galway Cycling Solutions were quietly happy with the response received from Transport Minister Shane Ross TD at a meeting held in the Dail on Thursday 19th January. 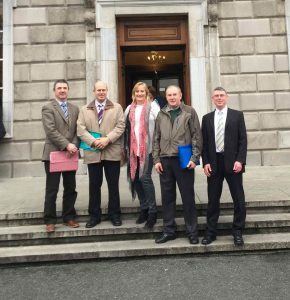 A delegation met the minister to raise community concerns regarding the handling of the western section of the proposed Dublin to Clifden Greenway. The group represent both cycling interests and affected landowners from the proposed route. Galway Cycling Solutions is in favour of a cycling project and discussed the well-established Eurovelo guidelines that have seen the creation of 70,000km of international cycling routes in mainland Europe. The Eurovelo approach does not rely on compulsory purchase of private farmland but uses a menu of options including farm tracks and country lanes with low traffic volumes. The group used an example of the existing Golden Mile initiative in Galway where local communities work together to celebrate local boreens as a resource for the community. The Eurovelo routes criss cross Europe on 15 main corridors. The Clifden to Dublin proposals are actually just a small section of Eurovelo 2 “the Capitals Route”. This passes through Dublin, London, the Hague, Berlin, Warsaw, Minsk and finishes up in Moscow. The formal proposal for the Galway Moscow route has been around since the late 1990s. Only a small component of the Eurovelo routes are completely traffic free. In fact, at the last count, 56% of the Eurovelo routes use existing low-traffic roads such as country lanes and forestry or agricultural routes. This is also an establish model for extensive national and local cycle routes elsewhere such as in Germany. In the Golden Mile program local communities work with Galway Rural Development, Rural Recreation officers and the County Council. They identify, “adopt” and celebrate sections of low-traffic local country lanes and boreens. The routes are assessed for safety and local children do projects on the wildlife and features of interest whether natural or historical. As of 2017 there are 166 Golden Mile projects in Galway. This program is seen as a better model for delivering cycle routes than the current top down approach. 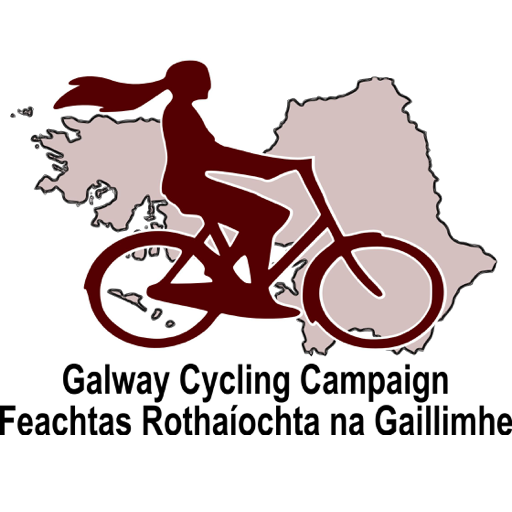 Galway Cycling Solutions includes cycling interests but also represents up to 1,000 landowners and home owners. The group made it clear to the Ministers that the issue is not one that can be resolved through increased financial compensation. Many of those affected are adamant that money cannot make up for the disruption that the current proposals would bring. The meeting was also attended by Junior Minister Patrick O’Donovan, Minister Sean Canney, Deputy Michael Fitzmaurice and Deputy Ciaran Cannon and officials from the Department of Transport, Tourism and Sport. Ministers Ross and O’Donovan indicated that the matter had been on their minds since entering office and accepted that there had been flaws with the process to date. The Department is shortly to announce a public consultation designed to achieve a changed process for delivering a national cycle network. However it is to be assumed that the project teams remain in place and consider that they still have mandate under the original process.